Cauliflower Steaks with Spinach Gratin Fill 1 Created with Sketch. 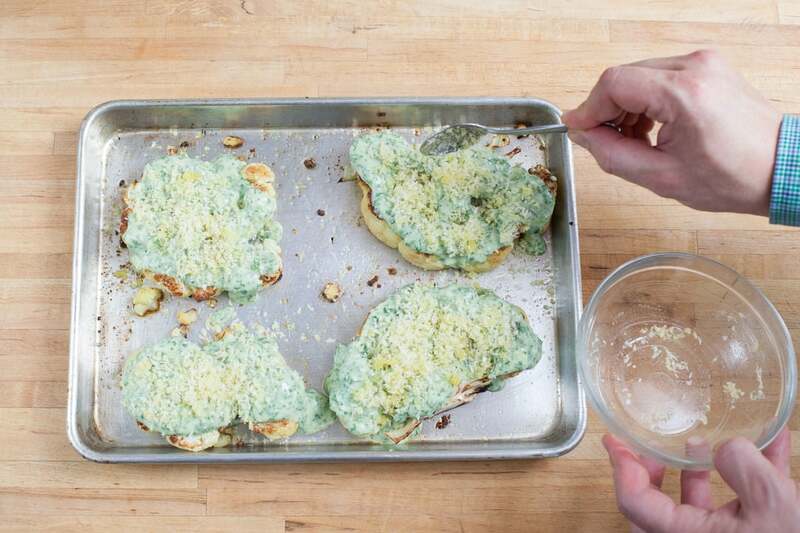 In this recipe, we’ve taken the typical gratin to the next level by transporting it out of the casserole dish and onto a cauliflower steak. We hope you find the combination of creamy spinach and cheese with a layer of crunchy, golden crumb topping to be delicious and irresistible. Preheat oven to 500°F. Heat a medium pot of salted water to boiling on high. Wash and dry the fresh produce. Trim the ends off the green beans. Very finely chop the spinach. Peel and mince the garlic. Grate the cheese. 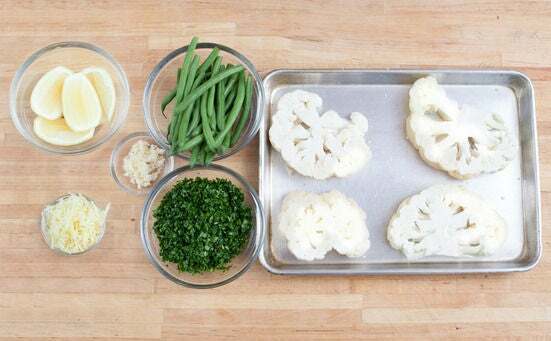 Cut the cauliflower in half lengthwise, then cut each half into 2 thick slices, leaving the core and stem intact. Cut the lemon into 6 wedges and remove the seeds. Place the cauliflower steaks on a lightly oiled baking sheet. Drizzle them with a little olive oil and season with salt and pepper on both sides. Roast for 20 to 22 minutes, or until slightly browned and almost tender when pierced with a knife, turning over halfway through. While the cauliflower roasts, add the green beans to the boiling water and cook 2 to 3 minutes, or until bright green and slightly tender. Drain and rinse under cold water. 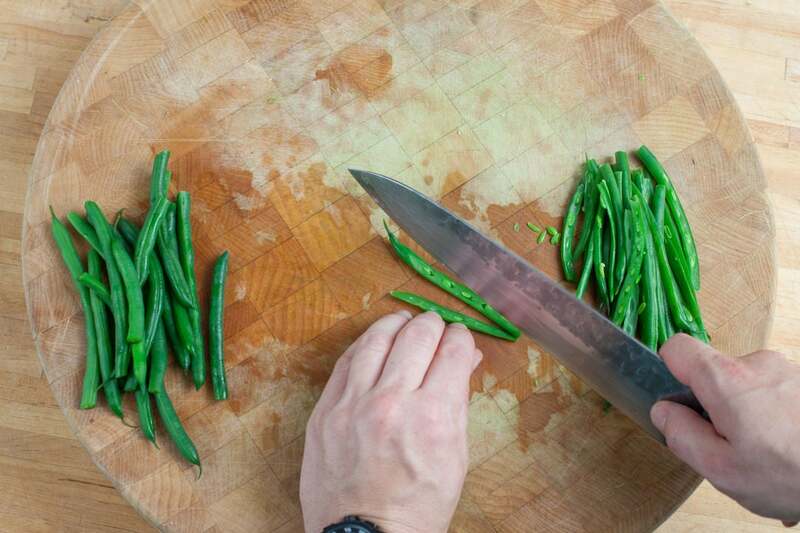 Slice the drained green beans in half lengthwise. 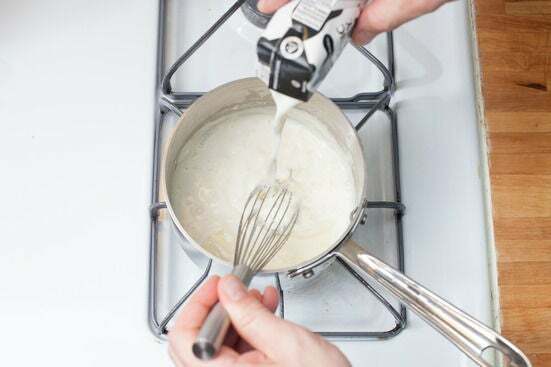 In a small pan, toast the slivered almonds on medium heat for 2 to 3 minutes, or until golden brown, stirring frequently. 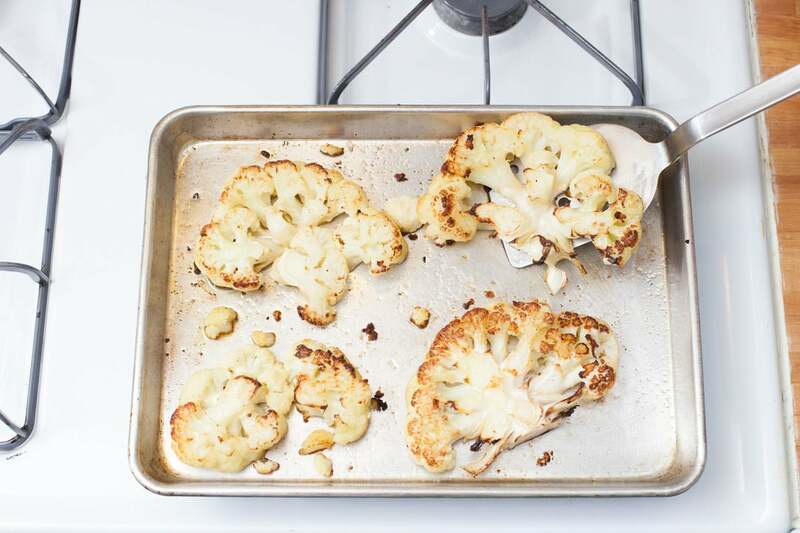 While the cauliflower continues to roast, melt the butter in a small pot on medium. Add the garlic; cook about 1 minute, or until softened. Stir in the flour; cook 1 to 2 minutes, or until lightly golden and toasted. Slowly whisk in the milk, breaking up any lumps. Bring the mixture to a boil and reduce the heat to low; simmer 2 to 3 minutes, or until thickened. Add the cheddar cheese and whisk until melted. Remove from heat and stir in the chopped spinach; season with salt and pepper to taste. 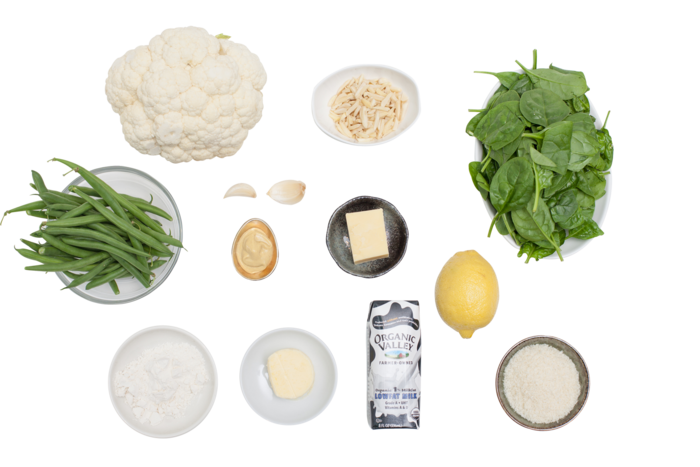 While the cauliflower finishes roasting, toss the panko breadcrumbs with a little olive oil to moisten them slightly. When the cauliflower steaks are done, remove from the oven and top each with a layer of béchamel sauce, then the panko breadcrumbs. Return to the oven and bake for 2 to 3 minutes, or until the crumbs are golden brown. Let stand while dressing the green beans. 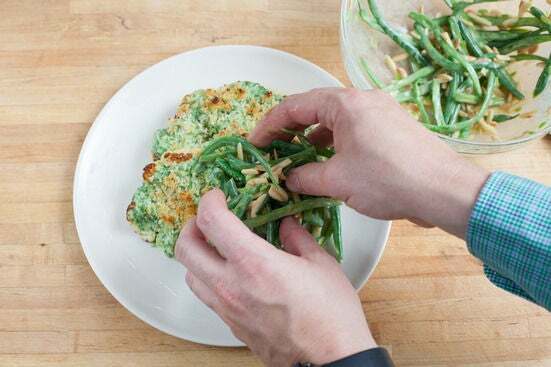 In a medium bowl, toss the green beans with the juice of 4 lemon wedges, the Dijon mustard, 1 tablespoon of olive oil, and the toasted almonds; season with salt and pepper to taste. 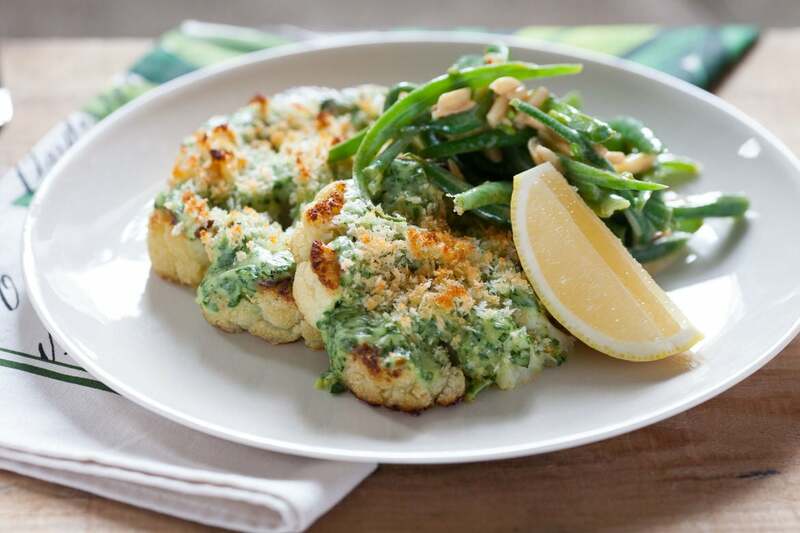 Divide the cauliflower and green beans between 2 plates. Garnish with the remaining lemon wedges. Enjoy!